Australian Rules football countries around the world are in full swing with fundraising activities to get their players to the 2005 International Cup. South Africa recently had a very successful fundraising dinner in Melbourne, with around AU$25,000 raised. The Australian Rules Football League Ireland are also well on the way, as are the Papua New Guinea AFL. In 2002, countries spent of the order of AU$100,000 each to get their lads to Australia. This has sometimes raised debate as to whether the money could be better spent developing their local leagues. But it is difficult to measure how important a tool the chance to represent your country is in recruiting and keeping players in the sport. The event is also vital in raising awareness in Australia and offers the chance for leagues to build links while they are Down Under. In the end, each country must make a choice. During one of the International Rules matches between Australia and Ireland last year in Ireland, the ARFLI organised collections around Croke Park, venue for the two games. They're now planning an ANZAC Day Masquerade Ball on Saturday, 23rd April. Proceeds will go to the International Cup costs. ANZAC Day is special to Australians and New Zealanders, as it commemorates the strong alliance between the countries, the sacrifices they have made in war. In some ways, the sacrifices of World War I are seen as a turning point in what were then relatively young countries, in terms of independence. As Australian Rules footy develops in New Zealand and around the world, footy related events may be increasingly common as a way of the two nations coming together, be it in the respective countries, Ireland, or anywhere else. For tickets, contact ARFLI through their website. 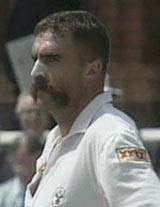 April 8th will see the AFL-PNG and the footy supporters club "KICK" putting on a show in Papua New Guinea with former Australian cricketers Rodney Hogg and Merv Hughes (pictured), and former Western Bulldogs AFL star Doug Hawkins. The Kokoda International Cavaliers Klub are a key in fundraising to get the Mosquitos down to Melbourne this August. Besides ticket proceeds, several items will be auctioned.